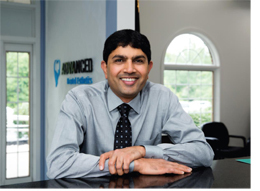 Dr. Dilip Dudhat, a 1996 Temple University graduate, is always ahead of the game in his field—from being at the forefront of the latest trends and technologies to constantly enhancing his education; each have made him one of the industry’s leading experts in the tri-state area. He takes pride in averaging close to 285 hours of continuing education credits per year, which far exceeds the 30 biennial credits required by the Pennsylvania State Board of Dentistry. The knowledge he gains from these courses not only benefit his professional growth, but also serve to enhance patient care through the training of his team and over 100 local dentists in the provision of the most advanced care. He has affiliations with practices in Warminster, Ambler, Collegeville, Abington, Lansdale, Bluebell, Whitehall, Phoenixville, Westtown, Colmar and the Northeast Philadelphia area. Each of his offices participate in major PPO insurance plans and submit medical billing for special procedures, as well as offering flexible payment arrangements so that dental work is affordable for all. After being greeted by his passionate team, patients can enjoy amenities such as a beverage station or a massage in a comfortable relaxed environment. The experience doesn’t end in the reception area; it continues into the treatment rooms where patients are seated in high-end massage chairs and can chose from a wide selection of music to be played while undergoing dental treatment. Patients can also can use an iPad or enjoy one of their favorite television shows. Most patients can indulge in total relaxation with these offerings; however, for those who are extremely fearful of dentistry, they have the choice of completing their care utilizing different types of sedation, including mild anesthesia, such as nitrous oxide. With the oral-systemic connection being at the forefront of dentistry, it is imperative for the entire team to ensure all patients receive a comprehensive evaluation. The new patient experience begins with a thorough medical history review, blood pressure screening and evaluation of oral abnormalities utilizing technology that allows for the detection of oral cancers at their earliest stages, so that there is a favorable prognosis. It continues with a full periodontal “gum” health assessment and a treatment plan that is individualized to the patient’s specific needs. Dr. Dudhat and his team realize how a healthy smile can change someone’s life and making a difference in how each patient looks and feels about themselves pushes them to work hard every day. He has placed over 10,000 implants cases including surgical placement, treating of failing implants, restoring from one tooth implant restorations to full-mouth cases. He is a Diplomat with the International Congress of Oral Implantologists and thrives on replacing missing teeth and creating beautiful smiles. For patients who are tired of ill-fitting dentures, the practices offer All-on-4 implant dentistry, which is typically less invasive than traditional dental implants and delivers great results with shorter treatment times. The challenges associated with tooth loss have driven the team to implement a strong preventive program and he is one of five percent of dentists certified in LANAP laser therapy—an innovative, non-invasive treatment for periodontal disease that can lead to healthy gums and the retention of teeth for a lifetime. Additionally, his state-of-the-art facilities include the latest technologies, such as 3D imaging. This allows clinicians to view dental anatomy from different angles and the integration of an intraoral scanner, which captures all anatomical features in the mouth without the use of gag- inducing impression materials, leading to a more positive patient experience. For patients concerned with crooked teeth, Invisalign clear aligners are an effective cosmetic option offered to straighten teeth, close gaps and correct bite issues. Dr. Dudhat has been whitening teeth since 1996, so patients unhappy with the color of their teeth have several options for whitening, including GLO Science technology which has revolutionized tooth whitening. While providing exceptional care within the practice is of great importance, the teams’ passion transcends past the walls of his offices. Their attentiveness and comprehensive care extends into the community, as they offer courses to the public—educating them on what options they have when it comes to dental care and the importance of oral health for people of all ages. Dr. Dudhat recognizes his success is dependent on creating a strong team environment. He continuously provides continuing education opportunities, plans many team building activities and is focused on calibrating the treatment pro- vided by his team to each of their patients. It is important that all team members are well-educated on ever y procedure offered within his practices, so they can answer questions and provide personal attention to help appease any fears or concerns patients may have. They will work together to create a relationship that ensures continuous care and a bright healthy smile. It is evident that Dr. Dudhat and his team will continue to work towards being the best at what they do and their passion and drive should be emulated by others.